Government intervention at the ASEAN People’s Forum (18-20 Oct 2009) was two-fold. ASEAN governments should have more faith in civil society. The recent out-roar between civil society organisations and governments on 23 Oct 2009 at the ASEAN Summit speaks volume of the collective distrust between the ASEAN governments and civil society at large. The ASEAN People’s Forum (APF), held from 18 October 2009 to 20 October 2009, had elected 10 country representatives to speak at the interface dialogue between Civil Society and the governments at the ASEAN Summit. 5 out of the 10 elected representatives were rejected and 4 out of the 5 rejectees were replaced by Government-sanctioned nominees. The rejected APF nominees include Singaporean Sinapan Samydorai. He was replaced by former civil servant Thali Koattiath Udairam. Mr Samydorai is a well-known advocate for migrant workers’ rights in Singapore and is also the Executive Director of Think Centre. On the other hand, Mr Udairam is a former civil servant who is currently the Chairman of Mercy Relief and the CEO of Changi General Hospital. The chairmanship of Mercy Relief is actually a Government-appointed position. On 20 Oct 2009, The Online Citizen (TOC) confronted Mr Udairam at Regent Cha-am, on whether his appointment to the interface dialogue has been pre-determined. He replied that if he were to be APF’s Singapore representative at the interface dialogue, he would only speak on issues related to disaster relief and management. This supported TOC’s suspicion that the Singapore Government had intended to set the agenda for the interface dialogue between civil society and the ASEAN Summit – sticky issues such as the rights of migrant workers in ASEAN and the growing trans-boundary informal economy in Southeast Asia should be avoided at all cost. However, Mr Udairam was very quiet during the nomination process when Singaporean delegates were calling for nominees to represent Singapore’s civil society. Mr Udairam would have made a great candidate for the representation of Singapore’s civil society at the regional level given the extent of Mercy Relief’s work in disaster relief and management throughout Southeast Asia. There is really no good reason why the civil society representatives of Singapore present at the ASEAN People’s Forum would reject Mr Udairam’s candidacy should he stand up for nomination. Mr Udairam has the credentials to represent Singapore at the regional level while it is very likely that the other APF representatives would be advocating the sticky issues. In fact, the departure flight of the majority of Singaporean participants was set on 21st October 2009, so only 1 or 2 Singaporean civil society participants would actually be able to participate at the interface dialogue on 23 Oct 2009.
Who are these government-sanctioned nominees? They are representatives from Quasi Non-Government Organisations or QUANGOs. Depending on the setup, a QUANGO could be an official government agency such as the People’s Association in Singapore. A QUANGO can also take in the form of a supposedly independent collective of of individuals who are allied with the government. An example of such a QUANGO is the United Nations Association of Singapore which is dominated by current and former diplomats. By the late afternoon on the 1st Day of the APF, QUANGO participation became more apparent despite the fact that the ASEAN government officials had turned down invitations to attend ASEAN People’s Forum as dialogue partners. Myanmar embassy officials were spotted mingling among the civil society crowd although there was no formal announcement of any government participation. QUANGO representatives sought to be included on the dialogue panel for each ASEAN pillar (Socio-Cultural, Economics, Peace & Security, Environment) during the preparatory meetings for the next day’s dialogue sessions. During the 2nd Day of the APF, the clash between civil society and government became more apparent. One Malaysian announced from the floor the Malaysian Foreign Ministry had handpicked a representative for interface dialogue. During the Peace and Security Dialogue, the Burmese issue dominated the session. Myanmar’s human rights records was open to scrutiny, with pro-Junta QUANGOs defending the Myanmar’s human rights record while the Burmese Opposition and Civil Society groups dissected the Junta’s defense with tenacity. The venerable Ashin Sopaka of the International Burmese Monks Organisation implored ASEAN to address the root causes of drug trafficking, human trafficking, and refugee flows in the region which are all linked to Burma’s State Peace and Development Council (SPDC). Condemning ASEAN’s policy of non-interference, he said that “Burma is the measure of ASEAN’s success or failure”. A speaker from an SPDC-backed organisation criticised the forum’s use of the name Burma as opposed to Myanmar, and pleaded for patience in the build-up to elections in 2010. A Burmese border-based group representative responded by saying that the democracy movement has extended their hand in compromise, and it was up to the junta to unclench their fist. On the 3rd and final day of the APF, the QUANGOs proposed amendments to the ASEAN People’s Statement drafted by Civil Society representatives. The rectification process for the Peace and Security Pillar in the ASEAN People’s Statement was the most complex and heated one since it involves human rights. The QUANGOs’ amendments were meant to make the ASEAN People’s Statement more palatable for the ASEAN governments, but these amendments were met with disagreement and counter-proposals. Internal disagreement inside each country group on who should represent the country at the interface dialogue between civil society and governments during the ASEAN Summit erupted. Despite that the nomination process for each country representative is open to every participant, there is no unanimous acceptance of the nomination result in certain country groups. Some delegates from Vietnam and Myanmar had requested the Secretariat of the ASEAN People’s Forum to increase their countries’ representation from 1 to 2 so as to accommodate the political divide in their respective countries. The request was rejected because the number of country representatives has been fixed by the ASEAN governments. 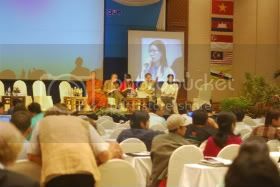 Despite certain compromises has been made between the Secretariat of the ASEAN People’s Forum and the ASEAN governments in order to facilitate exchange between civil society and the governments, there has been active government intervention in setting the agenda and the flow of debate at the ASEAN People’s Forum. This is testimonial to the level of distrust of ASEAN governments towards civil society. The interface dialogue at the ASEAN Summit actually consisted of 2 sessions. The first session took place in the morning and it involves the APF and government-sanctioned nominees. The second session took place at noon and it is a meeting between the Thai Prime Minister (as the Chairman of ASEAN) and 40 Civil Society Sectoral representatives from all over Southeast Asia. Problems occurred at both sessions. For the morning session, the ASEAN governments rejected 5 nominees from Burma, Cambodia, Laos, Philippines and Singapore. All except Philippines replaced the rejectees with their own sanctioned representative for the morning interface dialogue. Moreover, all representatives to the morning interface dialogue were not allowed to speak. Only the government-appointed moderator (a university academic) was allowed to speak and she was allowed to only read aloud the ASEAN People’s Statement to the ASEAN governments. This session is only 30min. After deducting the time for government’s response and the moderator to read aloud the ASEAN People’s Statement and the government, each APF nominee actually has less than 2 minutes to defend or elaborate their case to the governments. The high-handedness in tackling civil society is indeed unnecessary and smacks of excessive paranoia. For the noon session, 40 sectoral representatives were meant to meet the Thai Prime Minister at noon. However, the Thai government rejected Rohingya, Khmergrom, and Burmese groups in the second session. The responses towards the rejection of certain sectoral groups for the 2nd session was mixed. Some voiced up that despite 3 groups were rejected, the remaining groups should participate at the 2nd session and voice up for the rejected groups. However,there were others who emphasised that civil society should stage a walkout to express solidarity with the APF as well as to protest against the lack of government’s measure and sincerity to help the People. In the end, the group decision taken was to stage a walkout too.